John 3:16-17 16For God so loved the world, that He gave His only begotten Son, that whoever believes in Him should not perish, but have eternal life. 17For God did not send the Son into the world to judge the world, but that the world should be saved through Him. I remember crying the night before we sent each of our kids off to kindergarten. It was hard to let them go, even for a morning, for we had no idea what the world would offer them. God knew what the world would offer the Christmas Child – nine safe months in Mary’s womb, then birth, thirty-three tough years, and a cross. I wonder if the Father cried as Jesus left for earth. It’s not just Good Friday that holds sorrow – Christmas holds sorrow as well. I’ve rarely run across anyone who’s thought much about Christmas sorrow, but I think about it each December. There’s joy, to be sure, as we celebrate God’s gift of the Christ Child and welcome His arrival on earth. But we rarely notice how much this Christmas gift cost God. Father, Son, and Spirit knew what was coming: their gift led to a cross. The knowledge must have pierced their hearts. God endured as Father, Son, & Spirit heard each hammer blow on nails that bought us life. Sometimes love’s gifts break the heart. People who love us sometimes give us costly gifts, not just monetarily, but gifts that cost them personally. They give time when they’re exhausted. Hold back unkind words when we’ve hurt them. Put on a smile to hide tears that would dilute our delight. Parents do this regularly (and most children don’t catch on ’till they have children of their own). But Jesus recognized the cost and gave in spite of it. Hebrews 12:2 tells us to fix our eyes on Jesus who for the joy set before Him endured the cross, despising the shame, and has sat down at the right hand of the throne of God. Jesus wants us to sit by His side. His gift on one pain filled Friday made that possible. God, as we well know, gives us many gifts: sunsets and sunrises, children, friends and lovers, tastes of joy and peace and love. But His Christmas gift holds unique value. It’s not simply one gift in a string of gifts, but the prerequisite for all gifts to follow. 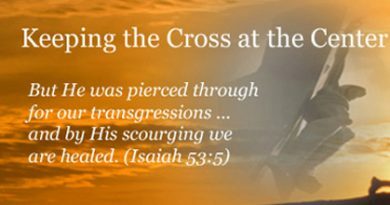 Had Jesus not left heaven there would have been no cross, no removal of the veil separating us from God, no forgiveness, no offer of life, no future in heaven, no feeding our damaged selves with spirit-piercing intimacy with God, no fulfillment of God’s hunger for spirit-piercing intimacy with us. Christmas permits Good Friday’s death; Good Friday’s death permits Easter’s life. They’re all related. Did you know that there are two ways to get into heaven? We can (1) be perfect or (2) pay the price for not being perfect. Imperfection, any imperfection, carries a death penalty. If you don’t want to pay it then someone has to pay it for you – and that’s what Jesus did. He didn’t die for any imperfection of His own; He died for our imperfections. He didn’t have to do it. But He did. Because He loves us. Good Friday is good because that’s when Jesus bought for us eternal life. Good Friday is the day of the best gift ever. Each Christmas we believe there will be gifts waiting for us under the Christmas tree. We can see from the looks on their faces how eager our families are for us to open their gifts. God feels much the same – only more so. He particularly wants us to open His Good Friday gift, for that gift is the gift of all gifts: a ticket into the unspoiled goodness of heaven. Romans 10:9-10 9… if you confess with your mouth Jesus as Lord, and believe in your heart that God raised Him from the dead, you shall be saved; 10for with the heart man believes, resulting in righteousness, and with the mouth he confesses, resulting in salvation. Salvation. Undeserved life. Such a costly gift! We are indeed deeply loved. God offers us life on outstretched hands. Have you accepted His gift for yourself?